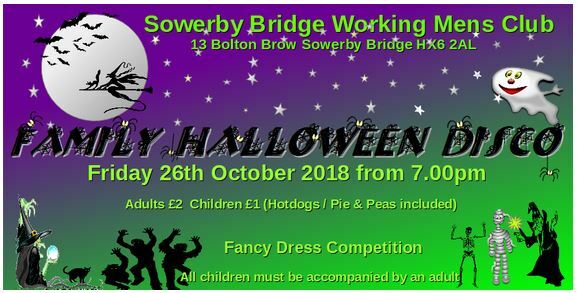 There will be a Family Halloween Disco on Friday 26 October, 7:00pm at Sowerby Bridge Working Men’s Club, Bolton Brow HX6 2AL. Tickets are Adults £2, Children £1 (all children must be accompanied by an adult). The entrance fee includes hotdogs / pie and peas. This entry was posted in Events, Oct, Sowerby Bridge and tagged Sowerby Bridge Working Men's Club. Lower Valley Friday Flyer 21 September – OUT NOW! !